Filimoni Seru and Josua Kerevi were best buddies during their high school days at Natabua High School. Little did they would know that they would travel together to further their education and rugby. 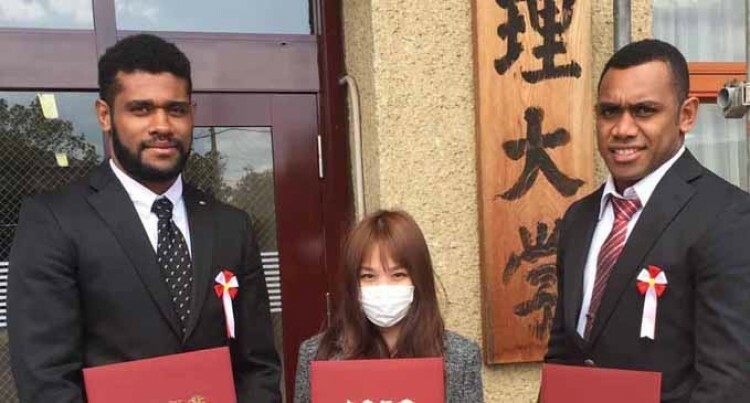 They left Fiji in 2013 and four years later, the duo succeeded not only in rugby but also graduated with flying colours from Japan’s Tenri University on March 22. “It has been an eye-opening experience for us as we learn the Japanese language and also their culture,” said Seru who graduated with a degree in Language and Japanese studies. The Tavuki, Kadavu native have secured a working contract with Secom company in Tokyo. He will be also playing for their rugby team. “I also aim to play for the Fiji national team if given the opportunity,” he said. Highlights of their rugby career in Japan was winning the Kansai University Championship and also making it to the Top 4 stage in All Japan University Rugby competition. There are heaps of people Seru is grateful too. “Firstly my parents and family who had been very supportive and also to Mr Toshihiko Kinoshita of Dr Japan Company for his assistance in helping us further our rugby career in Japan. Believe in yourself and always aim high, anything is possible if you set your heart towards it,” he said. Seru attended NHS before joining Kelston Boys College in NZ. Josua is the younger brother of Queensland Reds centre Samu Kerevi. Their dad was a former national football star Nimilote Kerevi. Josua started his rugby career in Veiuto Primary School where he was coached by Owen Ratumaikoro and Timothy Nova. He made the Suva Milo Kaji Under-13 rugby team and under coach Lasarusa Senibale he was named the Milo Kaji U13 player of the tournament in 2005. Josua later attended NHS before drafted to the Tokatoka Westfield Barbarians 7s club. He completed his BA in Japanese Studies, majoring in Japanese Language. “Have completed my studies, it was difficult at first since everything is learnt in the Japanese language. Only a few classes were in English,” he said. Josua is heading up north of Japan to a city called Akita where he will be working and playing rugby for a club called Akita Northern Bullets. It is coached by former Flying Fijian star flanker Setareki Tawake. “I will be here as long as I’m working,” Josua said. He describes his rugby career in Japan to be an awesome experience. Kerevi would like to thank Mr & Mrs Kinoshita who supported their move to Japan and the Koroivunilagi family. Josua said upcoming players should keep working hard and giving his o her best as someone is always watching.